There is something about standing at places where great events occurred that stirs the soul and fires the imagination. 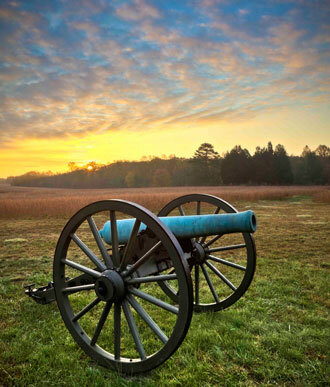 Fredericksburg and Spotsylvania County Battlefields Memorial National Military Park—the bloodiest ground in all North America—is one such spot. The park is home to no fewer than four major Civil War battlefields—ground hallowed by the blood of the 100,000 soldiers who fell here. Begin your tour at the Fredericksburg Battlefield visitor center, which features a short film and exhibits about the first of four battles. From here you can walk along the newly restored Sunken Road, a lane bordered by a stone wall, where, for eight hours, a few thousand Confederate soldiers held back repeated assaults of nearly one-third of the Union army. As you stroll down the road, you'll pass a simple stone monument marking the spot where General Tom Cobb was struck by a shell while directing his troops. You can stop at the Innis house, a simple frame house whose interior walls still vividly show the scars of battle. You'll see a monument to Sergeant Richard Kirkland, a 19-year-old Confederate soldier who risked his life to give water to wounded enemies. On your way back to the visitor center, reflect upon the cost of freedom as you walk through the national cemetery, a 12-acre plot of land where 15,000 Union soldiers lay buried. If time allows, there are three other battlefields to visit: Chancellorsville, the site of General Robert E. Lee's greatest victory; the Wilderness, where soldiers contended not only against the enemy but against raging fires; and Spotsylvania Court House, whose Bloody Angle was the scene of the most horrific combat in American history. Each battlefield has its own character and its own stories. Like old buildings? If so, Fredericksburg is the place to go. The town features dozens of 18th and 19th century structures such as the Rising Sun Tavern, the Hugh Mercer Apothecary Shop, and Kenmore, the home of George Washington's sister, Betty Lewis. You'll also find some interesting buildings in the park, including Chatham, the only house in America visited by both George Washington and Abraham Lincoln; Ellwood, a farm house used as headquarters by several Union generals; and the Stonewall Jackson Shrine, a modest frame plantation office where one of the South's greatest general drew his last breath. 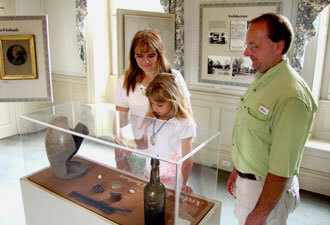 November is a great time to visit Fredericksburg. By then, summer crowds have vanished, summer's heat has given way to the cool, crisp days of autumn, and hotel rates are low. But leave yourself enough time. Too many people try to rush through the park in a single day. 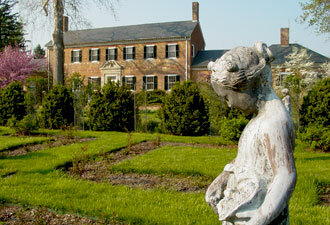 Instead, set aside two or even three days for your visit. Get to know the battlefields and the stories they have to tell. Let them stir your soul and fire your imagination.